Something very evil and very powerful was somewhere in the mountains. Warrior could feel it. It threatened the balance of the worlds, beyond the control of the Gods of Asgard.There would be a battle. It was inevitable, and Warrior knew it, a war in the Outer World that would have far-reaching consequences. This malevolent power was alien. It came from beyond the realms, beyond the territories of Earth, and yet it would use all the evil so long confined in the Underworld, calling out evil gods, raising terrible creatures and beings only vaguely remembered in myths and fables, and resurrecting vast armies from Man’s past.Skilled in command and in battle as Warrior was, this was beyond his experience. 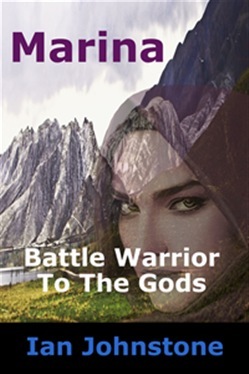 As reluctant as the Gods of Asgard might be to trust her fully, they needed Marina, Battle Warrior to the Gods. Her skills went far beyond those of mere mortals and even beyond those of the few gods who were practiced in battle. If the malevolent power could raise armies of the long-time dead, so too could Marina. More importantly, she had the intelligence to understand her enemy, to manipulate him, to wear him down, while the armies of the living and the dead battled across the Outer World. Acquista Marina, Battle Warrior To The Gods in Epub: dopo aver letto l’ebook Marina, Battle Warrior To The Gods di Ian Johnstone ti invitiamo a lasciarci una Recensione qui sotto: sarà utile agli utenti che non abbiano ancora letto questo libro e che vogliano avere delle opinioni altrui. L’opinione su di un libro è molto soggettiva e per questo leggere eventuali recensioni negative non ci dovrà frenare dall’acquisto, anzi dovrà spingerci ad acquistare il libro in fretta per poter dire la nostra ed eventualmente smentire quanto commentato da altri, contribuendo ad arricchire più possibile i commenti e dare sempre più spunti di confronto al pubblico online.